A proper look at the recently confirmed character. 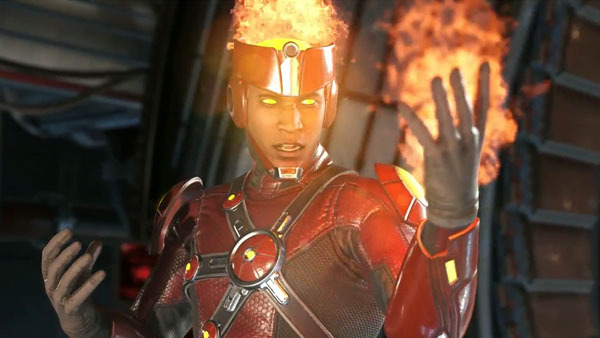 Following confirmation of the character earlier this week, Warner Bros. and NetherRealm Studios have released an overview trailer for Firestorm in Injustice 2. Source Crystals are a new type of currency available in Injustice 2 that are used to purchase cosmetic features for characters. Source Crystals can be purchased using real money but aren’t required to progress or advance in the game and can’t be used to purchase Gear or an advantage in gameplay. We value our community and want to be clear – you cannot “pay to win” with Injustice 2. Source Crystals can only be used to purchase cosmetic adjustments to your fighters, Premiere character Skins with no gameplay advantage, and various Shaders for character costumes. You can also Transform Gear with Source Crystals. Transform Gear allows you to apply the visuals of one piece of Gear to another piece. For example, if you have a piece of Gear with your perfect stat loadout but it doesn’t have your perfect look, you can apply the visuals from one of your other pieces of Gear to it. After using Transform Gear, your Gear piece will have your preferred stats matched with your preferred visuals. Source Crystals offer more opportunities to customize your fighters that won’t affect gameplay or game progression. The cosmetic adjustments to your characters are for you own personal preference of how you want your fighters to look, and can add details to your characters overall appearance. Character Shaders offer a wide range of color combinations for your character Gear. Premiere Skins will change your character’s look from top to bottom. For example, you can change Supergirl into Powergirl, but the power and stats of the character are still based on Gear equipment that you’ve earned through playing the game. The Premiere Skin change is only visual. Source Crystals can help you save time in the game. For example, once you level a character up to Level 20, you can use Source Crystals to level up other characters to 20. This is optional and won’t affect gameplay or game progression. Source Crystals can be purchased in the PlayStation and Xbox One Stores. What are Source Crystals and how do I earn them? Source Crystals are in-game currency that can be purchased for real money through the PSN and Xbox One stores. They’re used to purchase visuals or time savers for the game only. What can I get with Source Crystals? You can purchase Premiere Skins for select characters, Shaders for character costumes, and the ability to take a character to level 20 after you’ve leveled up a character to 20 prior. You can also unlock Transform Gear with Source Crystals allowing you to combine and forge Gear for your characters. Do I have to pay for Source Crystals? Yes, real money is used to purchase Source Crystals. What do you mean when you say Source Crystals can save time? After you’ve leveled a character up to the max level of 20, you can use Source Crystals to take another character of your choosing to level 20. This can only be done if you already have a character at level 20. Also, some Premiere Skins and Shaders are unlockable in the game via gameplay or if you want to save time, you can purchase them directly with Source Crystals. Do Source Crystals give me an advantage in the game? No, Source Crystals will not give you or other players an advantage in the game. They are used for cosmetic options and time saving purposes only. To be clear, we value our community and want to confirm that you cannot “pay to win” in Injustice 2. How much do Source Crystals cost? Prices for Source Crystals will be communicated at a later date. Injustice 2 is due out for PlayStation 4 and Xbox One on May 16. PlayStation 4, Xbox One, Clips, Fighting Games, Injustice 2, NetherRealm Studios, Trailers, Warner Bros.